Did you know event planning ranked as the fifth most stressful job of 2018? Coordinating a large industry event is high stakes, fast-paced, and unpredictable. Wouldn’t it be rewarding if, after all that hard work, you had proof that your event was making an impact? You get that proof if your event trends on Twitter, even for a brief period. Trending on Twitter confirms that your event achieved enough mindshare within your digital community to outrank other topics. It’s about audience and relevance. Your list of trends might be similar to that of a colleague who works in your field and follows similar profiles. Your list is probably also resembles the lists of users who attend your event, since you’re likely following and engaging with similar topics. Getting your event to trend means you’re being heard among the people you want to reach: people who are interested in and following topics relevant to your event. A trend can be a keyword, phrase, or hashtag. According to Twitter, what you see in the trends column when you log in is determined by an algorithm based on your location and who you follow. So your specific list of trends is unique to you and will be different than someone else’s list of trends. To get a more objective view of what’s trending beyond your network, you can adjust your trends settings to see what’s resonating generally within the specific region where your event is located. But you should only do this during the event. Otherwise you might miss some topical trends on your personalized feed. Make sure it’s relevant, unique, and concise, and then use it consistently. A primary hashtag creates a simple way for your audience to indicate that a post is relevant to your event. It also provides means of measuring the online reach of your event. You can count the number of times the hashtag was used, when it was used, by how many accounts, and so on. Make sure to include the primary hashtag in all event-related posts. Marketo prominently features its #MKTGnation event hashtag in its tweets, bio, and even its display name. Start using the hashtag early. Regular exposure to your primary hashtag will train your audience to start using it, too. Those who want to be included in the conversation (and they wouldn’t be posting on Twitter if they didn’t) will gladly use your hashtag. Also promote use of the hashtag to any sponsors and exhibitors who are part of the show. They’ll likely be doing their own social promotions, so make sure they can easily join the conversation to help boost the visibility of your hashtag. Don’t forget any employees or colleagues who are social and linked to the event. Employees can help boost your reach. 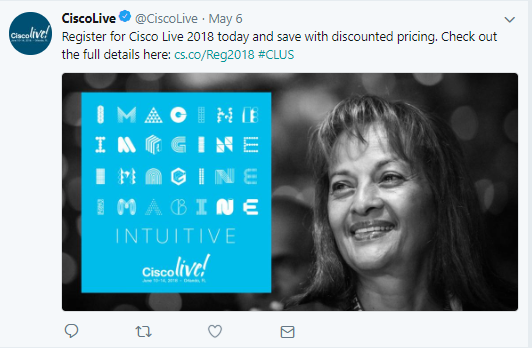 Cisco Live includes its #CLUS hashtag on all posts well before the event starts. Look for opportunities to align your primary hashtag with existing hashtags that already have a following. This will help align your event to relevant topics and enhance findability. For example, Mobile World Congress is an event focused on mobility. But within that main topic are several tracks, such as networking, security, and so on. A tweet promoting a session on mobile security should include other hashtags (but not more than one or two) that are already trending within that topic, along with the primary event hashtag so that people know that mobile security is relevant to the event. This strategy is especially valuable in driving registration leading up to the event. Add the primary hashtag to event signage, name badges, presentation opening and/or closing slides, screensavers—anywhere you can think of. By making it ubiquitous, you can turn the hashtag into a symbol that represents the event in the same way that a logo might. And with repeated exposure, attendees are more likely to use it, especially during the event. Always, always, always include the primary hashtag. The more you encourage consistent use of the primary hashtag, the more others will follow suit and help you achieve the critical mass needed to see your event trend. And when you do see your event trend, grab a screenshot, quick! The trend feed is a moment in time, but it’s also a good way to confirm that the content emerging from your event is resonating with your audience.